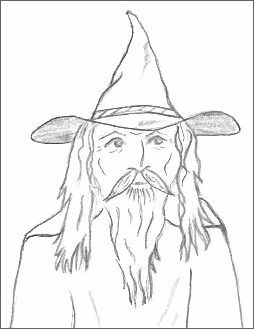 Here are some easy wizard drawings that I did in my first year of teaching myself to draw. I used a mechanical pencil, I like this type of pencil because it gives a nice, fine line and a clean look to a drawing. Even though this topic has a higher degree of difficulty for trainee artists, whether you copy it or not depends on how confident you are and what stage you are up to with your learning to draw experience. 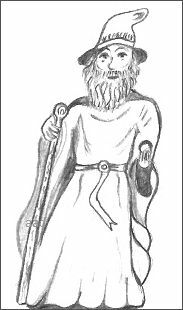 When you experiment with all different subjects, you discover new things about yourself so get your pencils out and try copying this very basic wizard drawing. If you don't like the results, hide the drawing or throw it away and wait until another day to try it because after a little bit of practice, you will be able to draw whatever you like. If you really want to get into drawing wizards, just do the top half of a wizard to start with. Once you get the hang of that part, then you can move on to drawing the whole form. At this early stage, I don't expect to make good reproductions but at least I'm willing to give it my best shot. It really gives me a boost when I create a reasonable picture, no matter what anyone else thinks of it. Drawing the human form is something that needs further study but at this stage, I'm so excited that I can draw, I want to push myself to see what else emerges from my pencil. I must be improving because I didn't struggle as much as I usually do with the face. What do you expect to see when you search for a wizard drawing? Hmmm, let's see, I think I need a drawing of a crystal ball. Oh dear, I realize now that it's not so easy to draw a perfect circle! You can buy a plastic template that has all different sized circles but I don't have one of those yet, so pardon the lumps! I was really surprised to learn quite a few artists use these circle templates to assist them with drawing eyes and irises, so it's obviously ok for us to use them as well. I know it is a really good exercise to continuously draw circles - large and small - as this helps you gain more control of the pencil. Once you can draw a perfect circle there won't be many other things you cannot do but it all relies on how much practice you do. 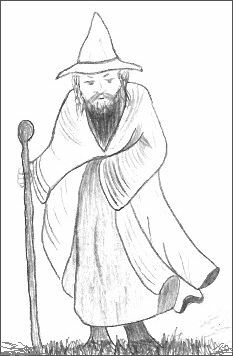 This drawing of a wizard is copied from a figurine ornament that I have at home. It's not a good illustration by any means but I need you to remember this image was created by someone who always believed they couldn't draw! My wizard figurine is holding a crystal ball but while I was researching information about wizards, there was not much mentioned about a connection with crystal balls so I'm only guessing here that it's one of the tools they utilize. I was very hesitant to try my hand at copying a small statue because at this stage I haven't attempted much drawing from life. While it is not a professional-looking drawing, I am pleased and proud of my version. The lesson I learned from that experiment is not to listen to the little voice that tells me I can't do things! For this page, I also thought you might like to see a bat hanging around. Ok, it's a cartoon bat drawing, but let's remember we are in fantasy land here! Cartoons are the best types of images for you to use in practice because they are easy to copy and draw successfully. This information is to help you create better wizard drawings and to give more insight about this fascinating character. Men with similar powers to a witch are called wizards. They need to learn and memorize their spells for them to be effective. Wizard means "wise one" - this refers to their wisdom which comes from supernatural powers. Wizards can make potions which can be used in conjunction with their magical powers. They also use magical artifacts or amulets to assist them with their magic. According to the dictionary, wizardry is a magic skill or magic which is a superhuman power. Astrology and fortune-telling are supposed to be forms of magic. Wizards command respect due to their specific skills and their tremendous knowledge. So, to summarize, wizards rely on their skill, knowledge, amulets and incantations when they cast spells. Incantations are special words spoken perfectly in a sequence. Amulets are stones, charms, rings or objects with supernatural powers. Wizards are also known as sorcerers. I hope you like these wizard drawings and that you're inspired to start drawing today. It is by practice that we learn about the essence of a subject. Once you know how to draw one thing, it's a solid step in the right direction towards drawing more subjects. All I ask is that you try it out for yourself, by making a simple mark on paper and see where it takes you. It has changed my life and I'd love that to happen for you, too. I wish you all the very best, as always.